This isn’t a new pattern, I’m slowly moving patterns over from Baking and Making and this has always been one of my favourites. 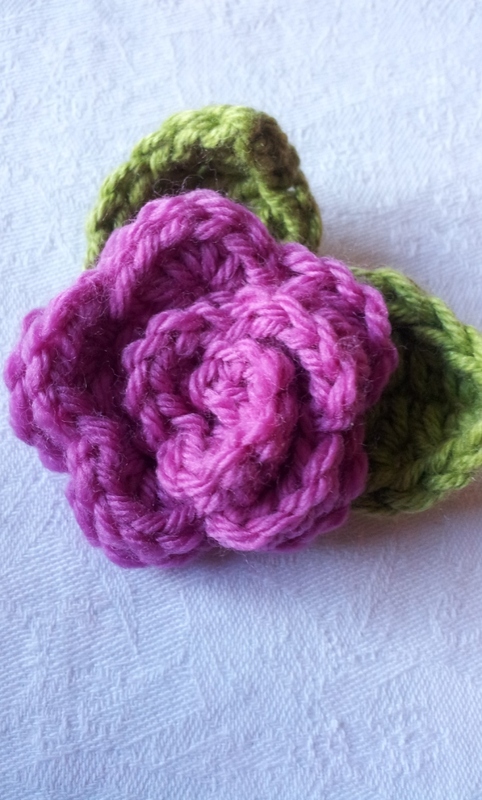 The flower is the same one I used for the Crochet Baby Hat I designed for Craftseller magazine a few years back, it’s such a versatile little pattern it can be used for almost anything. To make the pin cushion, you’ll need to stuff a tea cup with a small sachet filled with hollow fibre toy stuffing or a small shop bought pin cushion. You’ll have to use your judgement about how many flowers you’ll need to make to fill your tea cup. I use mine as a pin cushion, but it could equally be used as a centrepiece for afternoon tea (very vintage). I also like to sew a small brooch bar onto the back of a flower and a couple of leaves to make a pretty spring corsage and I’ll be teaching a class at Nettle in June for anyone who would like to try crochet. For details, click on the Workshops tab above (or click here). Row 1: 3 ch, 4 tr into 4th ch from hook, ss in next dc, [5 tr in next dc, ss in next dc] 4 times, [ 5 htr in next dc, ss in next dc] 5 times, [5 dc in next dc, ss in next dc] 4 times. Fasten off yarn leaving a long tail for sewing up. Roll petals into a rose shape and stitch securely using long tail. Round 1: *1dc into 2nd ch from hook, 1htr in next ch, 1tr in next, 2dtr in next, 1tr in next st, 1 htr in next, 1dc in last st**, 1ch. Do not turn, work into under side of foundation ch from * to ** ss into next st.
NB: This flower pattern started life as the “Tatton Corsage” designed for Fibre and Clay in 2011, it then appeared in Craftseller as a decoration on a hat, then as a wreath for Valentine’s day. It has so many uses and it’s appeared in several magazines in several different disguises. This pretty heart wreath is one of my favourites! Just bend a piece of wire into a heart shape. Thread on the flowers (made as above, I made about 18), fasten the ends of the wire and tie a bow at the centre . Hi Tracey – I want to praise you for sticking with the process to find the ‘right’ blog. As you have evolved, so has the social media. Now you’ve found the right home, I wish you every happiness and success in establishing your products ad patterns. I’ll certainly be keeping an eye on things as I continue to learn to crochet. PS I’m not sure if blogging is really right for me either yet I can’t just abandon it! Hi Tracy! I would like to make the heart wreath and wanted to kbow if you make the flowers them attach them together around the hanger or is their a pattern that you used. Thanks!